The last couple of weeks training have been good apart from the weather making a lot of runs harder than normal. Last week was a cutback week although really it was just a weekend cut back. I did a hard hill session on the treadmill in the evening on Friday then ran through treacle home so I knew I was ready for an easy weekend. The previous weekends long runs had been (going backwards) 35 miles, 35 miles, 32 miles, marathon, marathon so I felt no pressure to do anything. I have to confess to feeling a little smug when I saw the weather as it really was horrid out there most the weekend. The previous weekend I had intended to take it easy but decided that since the weather was half decent I would sneak in another 35 miles - that was a good move. Usually when I have an easy weekend I will do a long run of around 10-15 miles and possibly a tempo run or some marathon pace in that long run to get in some quality but I was feeling quite tired, probably from a couple of hard weeks so just did a couple of short easy paced runs each day. Total miles for the week - 72. By Monday I was raring to go so the 'rest' obviously did me good - had a great 5 mile tempo run which was 2 miles longer and also faster than the tempo run the previous week. Next hard session was not until Thursday where I did 5x4 min hard with 2 min recovery. Another great session and slightly faster than last week. This weekend the forecast was gales and wet. The plan had been 35-40 miles but in that wind? I had been checking the forecast for a few days and had downgraded my target to 30-35 miles. I knew it had to be done as I didn't run long last week and can't next week due to a 30km race. Last year when we had snow I did 50km on the treadmill so I hadn't ruled that out. Got my 'checkpoint' set up by the front door as I do loops so call home for food/drink/toilet but thought if it was really bad I would run to the gym. I am very slow on the treadmill so loaded up plenty of programs on the iplayer to watch! Long runs are not just about getting the miles in / time on feet but also for testing things. I knew in the wind my running would be rubbish but at least I could make it a worthwhile outing by testing a few things. 1. 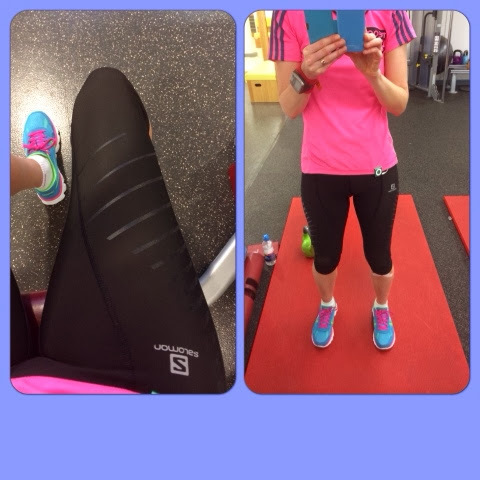 My new salomon compression tights thanks to Mr Ninebar for those, need to get the logo on. I like the tights as they have a zip pocket on the back which most compression tights don't have. They also have a couple of mesh pockets probably big enough for gels, tissues or sweeties. They seem to offer more compression in the lower quad area (where the stripes are) than my skins A400 tights. The material is not as soft as the skins but feels a bit more sturdy. The only issue with them, which is the case with all compression bottoms is getting them up and down quickly when nipping behind a bush! Normally in ultras I alternate powerbar protein bar with 9bars with the odd crunchie thrown in. These maximise bars are higher in protein than the powerbar - 9.5g compared to 7g for a 35g bar. 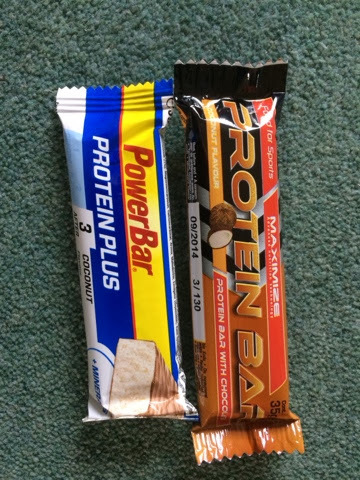 Most protein bars require a lot of chewing which is not ideal while running but both of these are soft and easy to get down, The maximise ones are nicer, more coconutty and a bit sweeter. The only downside is they don't contain calcium and magnesium like the powerbar ones but I checked the amounts and could get that much by popping a supplement if I felt I wanted it! This is blend of amino acids and electrolytes. Amino acids are a help prevent muscle breakdown; increase endurance; increases ability to recover and many other things. 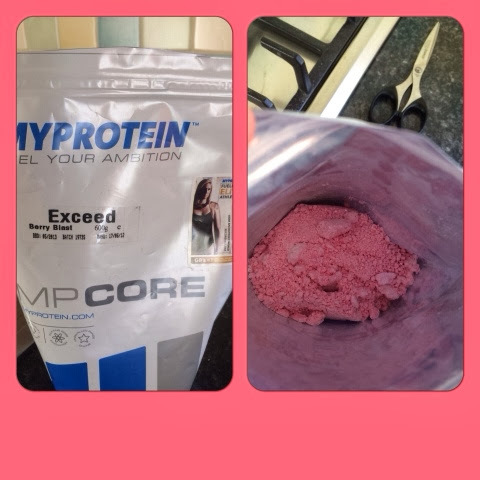 More info here http://www.myprotein.com/sports-nutrition/exceed/10636986.html this is my referral code which might get you something off MP383847. I have taken this a few times before running but never during so on one of my trips home had some. The taste is not great just about OK but not sure I would beable to get it down during a 24 hour race when my stomach is not at its best. Will need to experiment a bit - it might be more palatable if diluted more or perhaps add some juice to it. No idea if it made a difference as I only had 10g and the run was harder than normal due to the wind so it's not as if I was comparing like with like. The 35 mile run was hard going, I kept changing direction so was never running in to a headwind for more than a couple of miles at a time. Was glad to get it finished. I always run at an easy pace for long runs; two weeks ago that was 8.55minute mile, this week 9.05mm which considering it was much windier I am pleased with that. Today I need to do 15.3 miles to make the magic 100 miles for the week again. This morning I ran to town the long way to do some shopping. This afternoon I ran the long way to the gym where I did 3 miles of hills before running home ending on 100.2miles for the week. My 3rd 100 mile week this year.